When Johnny Sexton eventually hangs up his boots after what has already been a stellar career, the video montages to follow will surely all feature Saturday's dramatic winning drop goal prominently. Yet Irish head coach Joe Schmidt revealed afterwards just how close his out-half had been to being called ashore before it ever came to pass. The game-winning kick, which sealed a 15-13 win and stopped Ireland from being caught cold at the start of their Six Nations Championship once again, came with the clock only seconds away from 83 minutes, and in the time prior, Sexton was seen stretching out his legs. 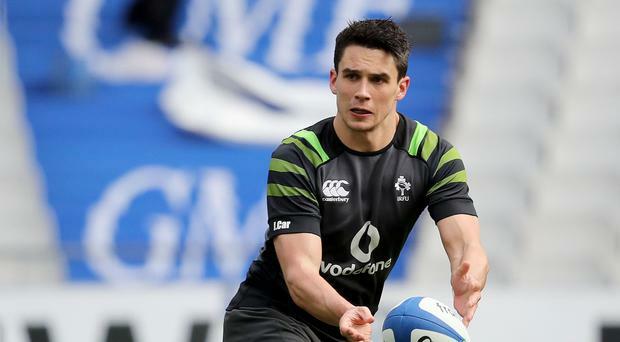 Schmidt used neither of his replacement half-backs in the game, but admitted Joey Carbery was warmed and ready to replace the eventual hero. "We had Joey up ready to go," said the Kiwi, now in his fifth championship at the helm. "I mean Joey has steered the ship home in the past, maybe not on as big a stage as this, but it was still a fairly big stage for us. "So it is one of those things where you say we are on the cusp, and then the physio said 'Johnny feels good, he feels he can continue' which is a relief for us." "He just had some cramp so he has no issues with his calves now. I don't think he can feel too much of his body." While Ireland showed that, no matter what the pre-tournament projections for Les Bleus, no win in Paris comes easy, there is no denying this was not as fluid a performance in attack as many will have hoped. With all 15 points coming from the boot of Sexton, Ireland will need to improve their output with the ball in hand if they are to be the ones celebrating come St. Patrick's Day. "We would certainly like to," said Schmidt when asked if he felt Ireland needed to be better as the tournament progresses. "But when you have to fight as hard as we did and you didn't get the tries and you don't get the flash finish that you like, you have got to roll your sleeves up and work a little bit harder to make sure you create those missing things. "What happened was we lost our shape, when if you look early in the game on penalty advantage we actually create really good space down the left-hand touch and quickly the advantage is blown up and we're given a penalty. "I actually felt we had put the ball through a few phases really effectively and that we had our shape about us. "The longer and more attritional the game went, it was just getting harder and harder. There was a lot of one-out carries from them and we resorted to it as well as the game got slower and the rucks got slower." If the ending will live long in the memory, it seems as if the minutes that preceded Sexton's moment of magic may linger too. France coach Jacques Brunel intimated afterwards that debutant Matthieu Jalibert and substitute nine Antoine Dupont had been taken off thanks to leg injuries, but the independent match doctor indicated to referee Nigel Owens that they had both gone for head injury assessments. In the case of the latter, this meant that the already substituted scrum-half Maxime Machenaud could return to the game in the 76th minute. While Schmidt said he would "leave the medical fraternity to work their way though that one", an investigation could produce interesting results. "SNRL has in place a Head Injury Assessment Protocol which has been approved by World Rugby," read a statement issued yesterday. "As part of that protocol, there is a process by which HIA/concussion-related incidents are reviewed. This involves an initial review by an independent HIA Review Processor and then in certain cases a further review. "The HIA Review Processor is reviewing a number of incidents from the France v Ireland match in the senior men's championship. Depending on their findings, SNRL will be considering the next steps in respect of those incidents."